It's Cookie Bookie Week! Come back every day for spooktacular October reading recommendations plus a few of my favorite fall cookie recipes. Since Dr. Jekyll and Mr. Hyde coinhabit one body, I've rolled two polar cookie personalities into one treat: The Split Personality Cookie. With one side evil chocolate and the other innocent buttery vanilla, it's guaruntee to appeal to both sides of our moral spectrums. It's simpler than it looks; you take a straightforward batch of cookies, split it in half and mix a little cocoa powder into one side and a little extra flour into the other. The result is both angelic and devilish. And you're going to love it. Preheat oven to 350 degrees. Cream butter and sugars in large bowl. Add vanilla and eggs and mix well. Add soda, powder, and salt. Mix in 2 cups flour. Divide dough into two somewhat equal portions and place in separate bowls(just eyeball it). Stir cocoa powder into one bowl; add remaining 1/2 cup flour into other bowl. Dough should only be slightly sticky, like play-dough, so add more flour by the tablespoon full if needed. Stir in 1 cup of M and MsTake 1/2 inch dough balls of each type and roll them into one cookie dough ball. Repeat process with all cookies. Bake cookies on cookie sheets for about 9-11 minutes. (I like them slightly underbaked.) Poke additional M and Ms into cookies immediately. And just to show you how it's done, take two balls of dough .... roll them into one. .and bake away. You can also bake a couple batches of each separate dough. wow that sure looks very innovative!..nice cookies..
very interesting! yummy looking cookies!!!! This looks like the perfect addition to a Halloween party! Adorable! I love it!!! What a great idea! I'm sure I could use that for some YW lesson. Any excuse for treats that double as an object lesson, right? I went a little Mr Hyde on a neighbor kid the other day. All it took was a few golf balls chucked at my kids and Mr Hyde came out to play. Although I think "mama bear" has a nicer ring to it. I'm so glad "Cookie Bookie" week is back!! 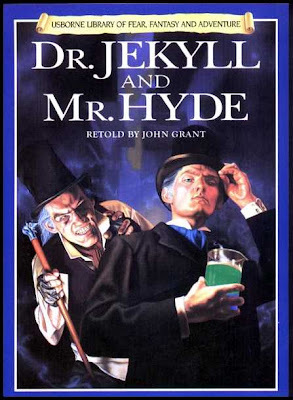 How have I never read "Dr. Jeckyll and Mr. Hyde"? I'm putting it on my list. I love your cookie. I always bake black and white cookies separately and then have to take a bite of each to enjoy all the chocolate and vanilla goodness. I'll definitely try them your wasy next time. Although in all honesty both ways are your ways! What fun cookies! So perfect for the spooky month of October! I always thought Dr. Jekyll would be the deranged individual who commits wrongdoing. The name Jekyll sounds far more insane and dangerous to me than plain old Mr. Hyde. The names always surprised me. But I suppose the names shouldn't since it's the same individual with the same capabilities, altered only by a dangerously magical, mysterious, potion. And the cookies look good, too. Love the whole "cookie bookie" theme. This is definitely going to happen at my house too.. BTW, I just made your buttermilk brownie recipe.... they are cooling as I type, however, we snuck some bites and they are FAB!! This is my go to brownie recipe from now on.. thank you..
Yay for cookie bookie! I love that cookie idea. Wow, those look great!! Fun halloween colors! Oh Cookie Bookie Week, I love you! yeah I'm excited about cookie bookie week!! I haven't read Dr. Jekyll and Mr. Hyde since seventh grade- but I might just have to re-read it now! The cookies look so great too- great for a Halloween party! What a fun cookie. Also--love your snap cookies on your other post, along with the muffins. yum, yum. i think this looks like a great read aloud once the kids and i finish "the legend of sleepy hollow." love the classic lit. I'm just here poking around at what I've missed. I just adore these Ms. Erin. How cute.